About 5,000 people from seven states in the north trooped out on Thursday for the proposed two-million-man march to welcome President Muhammadu Buhari back into the country and pray for the full restoration of his health. The crowd assembled at the Sani Abacha Stadium, Kano, where they chanted various solidarity songs before eventually offering prayers for the President. Shortly after the prayer session, the crowd headed for the Golden Jubilee Cenotaph situated around the Kano State Government House where Governor Abdullahi Ganduje received them. Apart from registering their loyalty to the President, the supporters also presented a letter to the governor for onward delivery to Buhari. 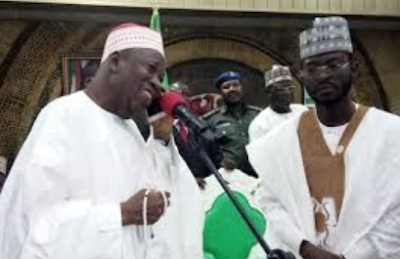 While thanking the supporters for their concern and prayers for the President, Ganduje said with the type of dedication shown by the former military general in tackling the challenges of the country, it won’t be long before things start moving in the right direction. However, Ganduje, urged Nigerians to intensify their prayers for President Buhari, who he described as not only a man of peace and equity but someone with a deep love for the country.